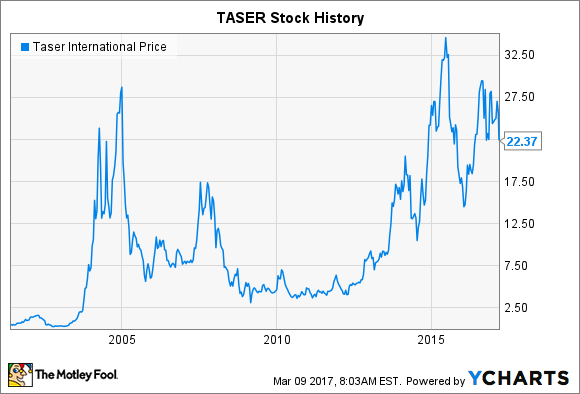 TASER Stock History: Is the Stun Gun Specialist Headed for New Highs? The maker of non-lethal weaponry has tapped into the law enforcement camera market. TASER International (NASDAQ:AAXN) initially made a name for itself with its then-revolutionary stun guns. By giving law enforcement officials a less-than-lethal option with which to incapacitate criminals, TASER pioneered an industry and forged partnerships with police departments across the world. Yet TASER now makes much more than just its namesake weaponry, having pushed into the market for camera systems and evidence management products. TASER stock has had its ups and downs, but recently, investors have seen that the company has the potential to grow dramatically in the future. TASER came public in 2001, and its stock had normal ups and downs over the course of its first couple of years. Bullish investors were convinced that TASER weapons had advantages over handguns, and law enforcement officials would gravitate toward purchasing less-than-lethal options as an alternative or supplement to their current arsenals. By 2004, that theory had borne out well, and shares soared to make TASER one of the hottest stocks in the market. Yet concerns arose about whether the market for TASER weapons would become saturated, and short interest in the stock ballooned to extremely high levels. In 2005, the stock collapsed, losing three-quarters of its value. Concerns about competition also arose, and high-profile cases involving the deaths of people against whom TASER stun guns had been used raised legal liability issues, as well. A rebound in 2007 proved short-lived as the financial crisis brought on a bear market that hurt stocks across the market. TASER stock was relatively stagnant until 2013, when co-founder and CEO Rick Smith made some major changes to the company's business model. By then, the need for law enforcement officials to have sophisticated video technology for collecting evidence and rebutting charges of police brutality was clear, and TASER's line of Axon body and vehicle cameras represented some of the most state-of-the-art technology available. In addition, the Evidence.com business that TASER incorporated into its suite of service offerings allowed law enforcement officials to store all the data that Axon cameras and other information-gathering technologies were accumulating, and its cloud-based system allowed for collaboration in a way that wouldn't compromise efficiency, or hinder legal proceedings further along. In combination with some simplifying moves in its pricing structure that made it easier for TASER to bring on new clients without having to negotiate deals individually in every instance, TASER stock responded positively to the strategic shift. By 2015, TASER stock was at new all-time highs, and it was clear that the market for Axon and Evidence.com was at least as big as demand for the company's namesake weapons. Yet despite making a high-profile name for itself, TASER still seemed to have plenty of runway left for further growth. Some estimates put TASER's penetration rate at between 8% and 20%, leaving many opportunities to add more customers. Can TASER stun investors with big gains? Over the past couple of years, TASER shares have given back some of their gains, but for the most part, that hasn't been a result of fundamental weakness in the core business. Rather, some investors have become nervous about the valuations that the stun-gun specialist commands, and even the hint of potentially slower growth has been enough to send the stock downward sharply, losing half its value between mid-2015 and early 2016. Yet TASER's most recent results show exactly how well the company is doing. In its most recent quarter, TASER reported sales gains of nearly half, sending earnings per share up by a third. The Axon segment saw revenue growth of more than 150%, and even the core weapon business saw sales climb 25% from year-earlier levels. TASER has made a smart move going beyond stun guns to incorporate broader service offerings for law enforcement officials. With pushes to expand internationally, as well as offering even more capabilities within its popular platforms, TASER stock has every opportunity to regain its recent losses and climb back toward new highs in the future.